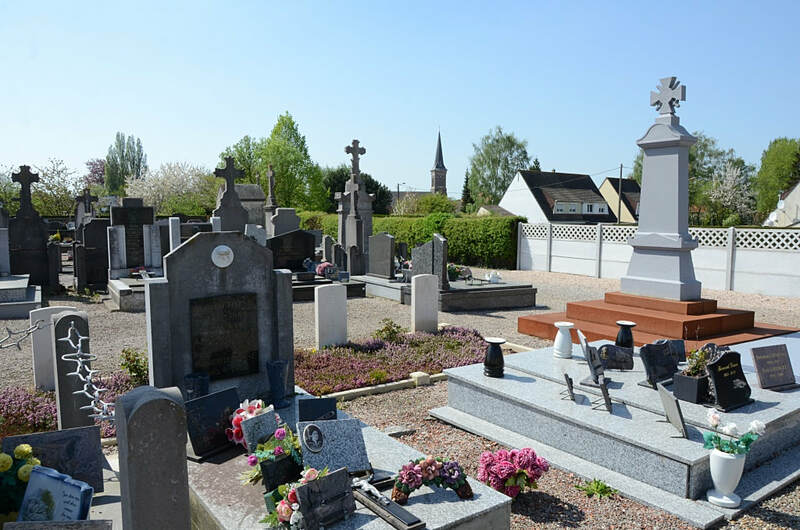 Allouagne is a village in the department of Pas-de-Calais on the D183 some 10 kilometres west of Bethune. When in the village, take the main road through the village and turn right approximately 300 metres past the church (Rue du cimetiere). The war graves will be found to the right of the cemetery entrance. The war graves are to be found in the North-East corner, near the entrance, behind the French War Memorial Vault. 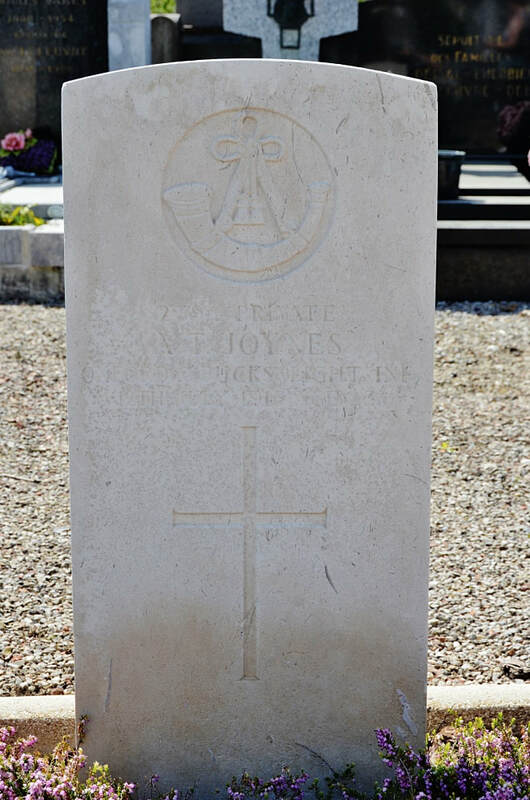 2394 Private Albert Thomas Joynes, 1st/4th Bn. 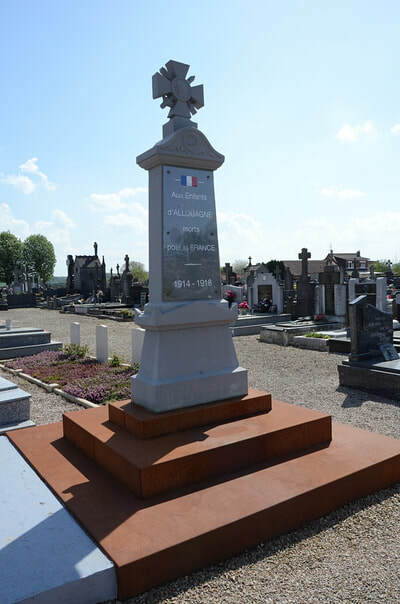 Oxford and Bucks Light Infantry, died 12th July 1915, aged 23. 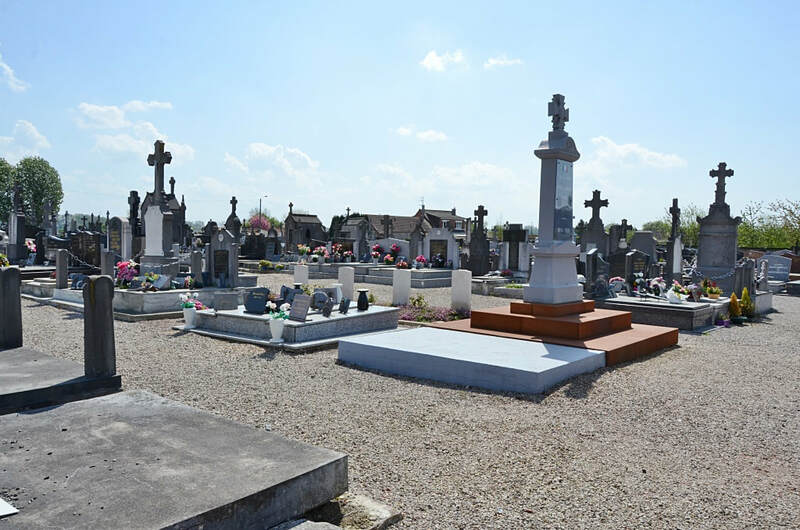 Son of Albert Joseph and Mary Annie Joynes, of Mickleton, Campden, Glos. 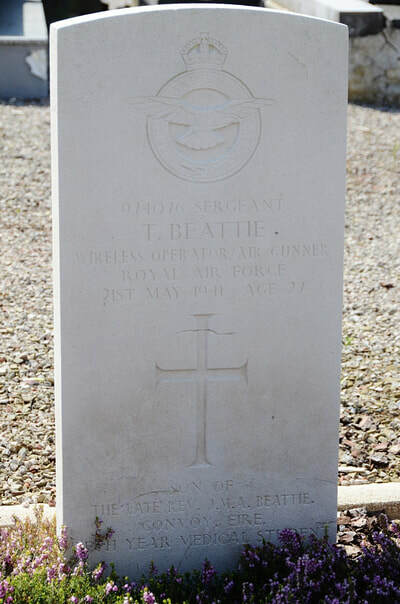 974076 Sergeant Tudor Beattie, Wireless Operator/Air Gunner in 110 Squadron, Royal Air Force Volunteer Reserve, died 21st May 1941, aged 27. Son of the Revd. 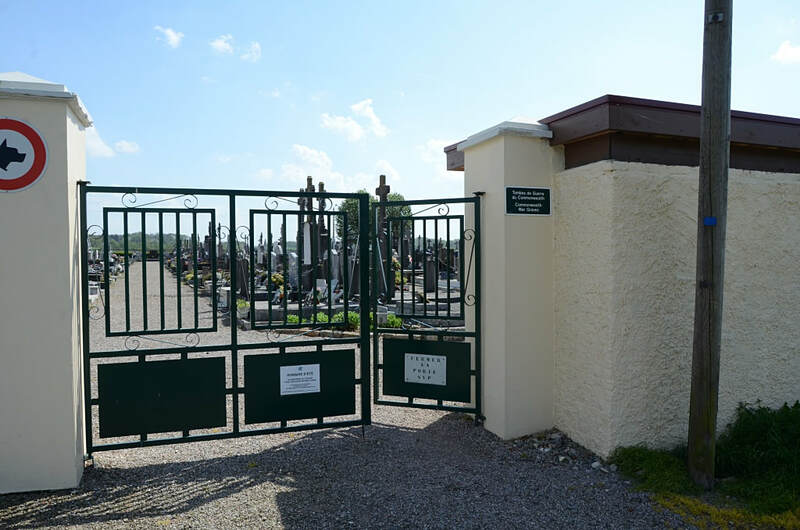 James Moore Allen Beattie, and of Margaret Jane Beattie, of Portrush, Co. Antrim, Northern Ireland. Fifth Year Medical Student. 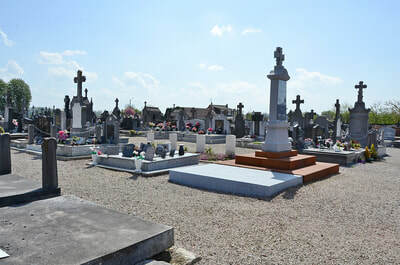 951120 Sergeant Joseph Arthur Donovan, Obs. in 110 Squadron, Royal Air Force Volunteer Reserve, died 21st May 1941, aged 20. 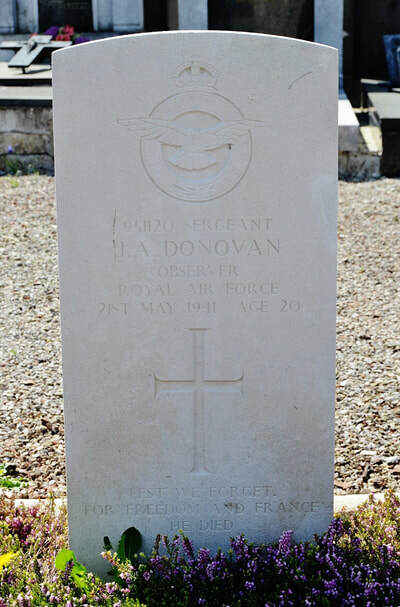 Son of Ernest and Amy Donovan, of Handbridge, Chester. 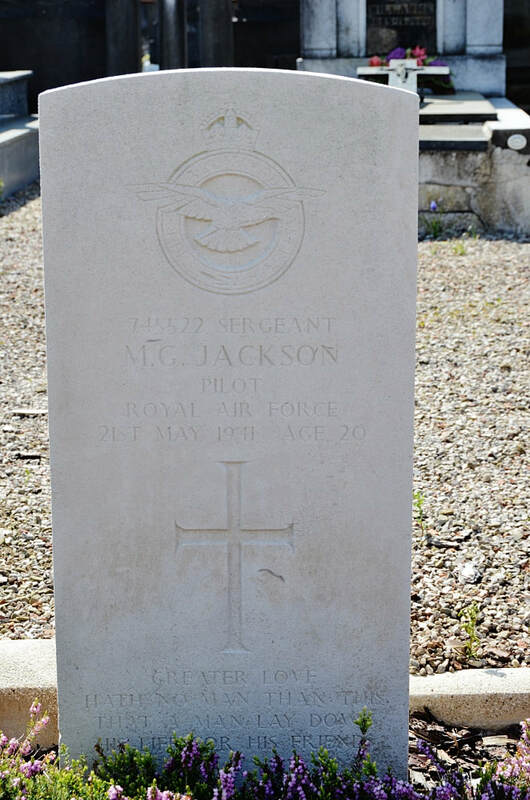 745522 Sergeant Maurice George Jackson, Pilot in 110 Squadron, Royal Air Force Volunteer Reserve, died 21st May 1941, aged 20. 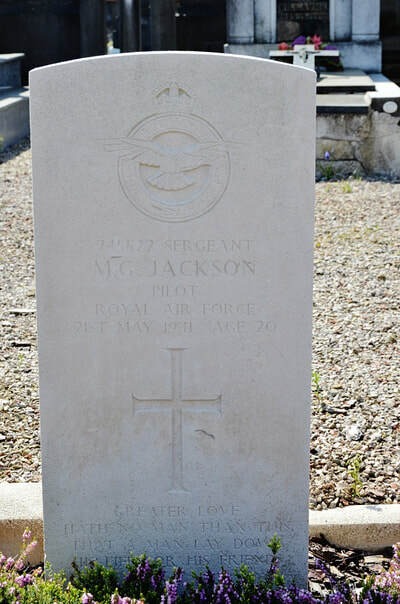 Son of Walter George and Nora Mary Jackson, of Barton under Needwood, Staffordshire.